Symmetrical Triangle Pattern are continuation chart patterns for a financial security (stock,index,commodity,currency etc).These patterns signal Bullish or Bearish price moves in a security in the near future,depending upon the direction of price breakout. Identifying and trading Symmetrical Chart Pattern correctly enables you earn substantial profits in trading in shorter periods of time with a small risk. This is because Stop Loss is not usually very far away from your Trade Entry Price. 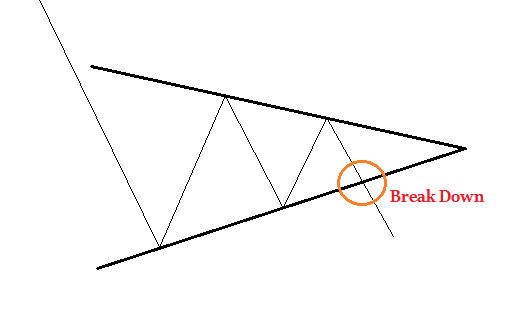 In Bullish Triangle Pattern,the price movement makes two troughs and breaks out on the Upside above the upper downward trending line.Care should be taken to note the Volumes while this breakout happened. A higher then normal average Volumes indicates more participation from the traders and rules out the possibility of being the breakout False.So the likelihood of prices reaching the target is more. 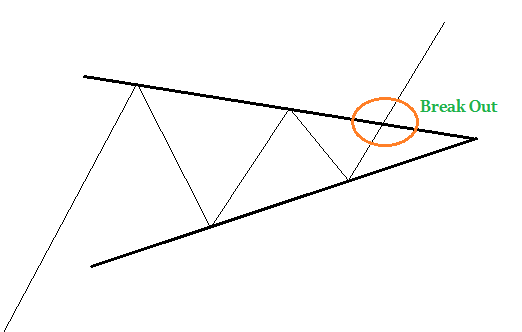 To find the Target price likely to be achieved by this pattern,subtract the price corresponding to the lowest point in the Triangle from the price corresponding the highest point inside the Triangle.Add this Difference to the price corresponding to the Breakout price and that is your Target for this trade.The lower trend line acts as a Support and Stop Loss for this trade. As long as the price keeps trading above the lower trend line,the Target is likely to be achieved in the coming days.So you can initiate your Long Trade by buying the stock or index at Breakout Point. The duration for the trade depends upon the time taken by the pattern to complete.A Pattern taking weeks to establish would be reaching the targets in weeks.Similarly,the Pattern formed in days may hit the target in span of few days only. The Bearish Triangle Chart Pattern is very similar to the Bullish Triangle.The difference is that here the breakout happens towards the lower side of the Triangle.So prices are likely to head lower in the coming days or weeks. The method of calculating the target price and stop loss is also similar for the Bearish pattern.Here the Upper downward trending Trend line acts as the Resistance and also the Stop Loss for the trade. Here again,you should also look for Higher Volumes at the time of Break Down to rule out the possibility of False Break Down.You can Initiate your Short Trade by Short Selling the stock or index at Break Down point.